The season two opener really upped the stakes not only in terms of the narrative, but also in the show as a whole. The specific subject matter is not only original, but unprecedented in media, much less encapsulated in a TV show. I made a TURN/American Revolution/’My Untitled Novel’ playlist which really sets the mood for me while I’m writing or editing. If you’re not watching TURN–you should be. Although there are plenty of historical deviations, I try to always view period shows or shows based on books as their own entity or else I’d go mad. That said, it is important to recognize there is so much of the same out there in TV, despite the fact that we are in the Golden Age of television. AMC has consistently produced work that is far above the rest, Mad Men being a prime example. They also seem to excel at historical shows (like Mad Men, which set the precedent for them), along with Hell on Wheels and TURN. I am so thankful that a story as original and complex as TURN is on TV right now, whereas maybe ten years ago it would have been a movie if anything at all. I agree! This show is definitely worth a watch and I learned so much for it too. 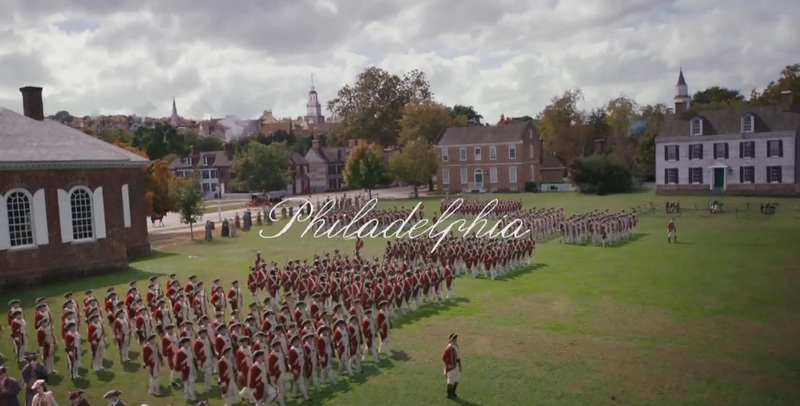 Are you aware that “Philadelphia” on Turn (including the shot above) is actually Colonial Williamsburg? I’ve been there many, many times, so I immediately recognized the locations. I highly, highly recommend a trip to CW if you haven’t been already. Yes! I really want to go sometime as I have never been.